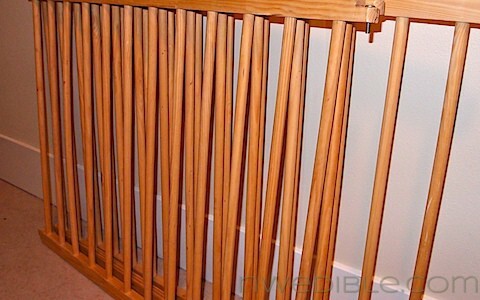 The ad on Freecycle said, Wooden Baby Pen, and described some sort of a freestanding baby jail made from dozens of dowels. With visions of a garden cucumber support in my head, I said I would love to have it, and could promise reliable pick up. 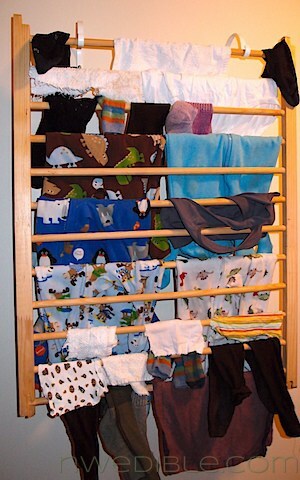 Before I could worry about trellising cukes, laundry room inspiration hit and baby jail was repurposed into a wall-mounted indoor diaper and small-clothes drying rack. This project was 100% free. 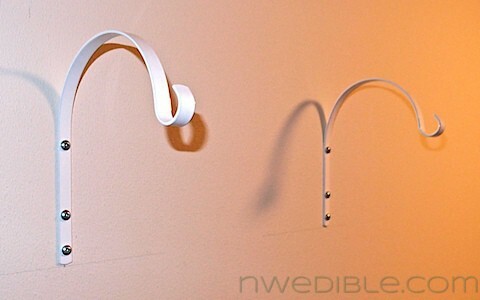 We used two of the baby jail panels off Freecycle and four white, wall-mounted plant hooks we had on hand. Homebrew Husband screwed the plant hooks into studs. Then the baby jail panels were simply hung sideways from the hook. Because of the design of the plant hook, they naturally stand-off from the wall about 6-inches, which gives plenty of room for diapers, socks, undies and other small items but keeps the panels from taking up precious space in my narrow laundry room. Now, I will admit I am not exactly a line-drying guru, but I do manage to line dry my son’s cloth diapers most of the time.This is how I used to line dry my diapers. I had stretched a travel-clothesline in front of the laundry room window, but it gave up its zip long ago, and had a perpetual sag. Baby clothes, socks, undies, cloth wipes etc. do well on the rack too. Anything that isn’t too large for the multiple-rungs of the baby jail panel. Homebrew Husband and I are thinking of adding a hinged prop at the bottom of the drying racks which would allow them the stand out from the wall more at the bottom when in use. 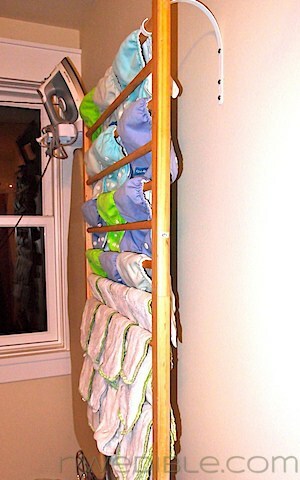 This would give the clothes on the rack greater air-flow and allow me to pack them full without too much fabric overlap. For now, and for the small, fast-drying things we are drying on these racks, that hasn’t been necessary, but is something we’d do if we used the rack for heavier-weight items. Edit 3/26/12: Some great reader comments convinced me that my thought of propping the racks up at the bottom so as to increase air flow was something to implement sooner rather than “someday”. I wasn’t able to built a permanent, hinged fix but a branch spreader for fruit tree training will do the trick nicely until a less rustic solution can be found. Because of the shape of the hooks, the baby jail panel swings easily outward at the bottom while still hanging securely. Check it out! UPDATE: I have improved upon this clothes drying rack, doubling the drying area, increasing airflow and making it easier to use. I am thrilled with the “final draft.” You can see details of the improvements here. Do you line dry any of your clothes indoors? If so, what’s your best tip or tool to make avoiding the dryer a little easier? Great idea! …reminded me of something I saw on the BBC Victorian Farm series … http://www.youtube.com/watch?v=NA1269IgGY0 (I don’t remember the exact episode and it might have been from the Edwardian Farm or Victorian Christmas series– LOVED all these episodes and you can see them on youtube) but basically the dowel rack was on a pulley system which lowered it horizontally from the ceiling as needed for drying and raised it when it wasn’t being used, if that makes sense. Love the Victorian Farm series! I’ll have to hunt down the line-drying episode. Ya know, my parents still have my crib, I bet I could reuse it similarly! Love the baby jail panels! We have retractable clothes lines mounted in our weird unusable expect for clothes drying and tomato growing basement space. The basement foyer? Or something. Anyway, I’m a bit of a line drying nut. Turning on the dryer for anything other than dog laundry makes me cringe. Can’t wait to see what you come up with for cucumber trellis. I’m starting mine inside this week. Nice solution! I just have one old school drying rack I use indoors, and otherwise just strew the wet clothes about the house. We can’t dry outside right now because all our clothes would turn YELLOW from the pollen! Question though – do you have a problem with crunchy diapers when you line dry? I’ll admit I machine dried all my cloth diapers because they turned into cardboard on the line. We do the pocket diapers mostly from Smarti pants, and they line dry well because they are microfiber. The cotton towels, now, THOSE turn to some sort of dermabrasion torture device when they are lined dried, so I know what you mean. I read somewhere recently that if you are hanging outside, let the laundry stay up over night and take in the next morning. As I recall from my own Diaper Hanging days (I was either lazy or not very good at time management, and I’d have to let them overnight or they’d be wet from dew.) Anyway, when you bring in the following morning or whenever, they will be soft!! Not sure why but they will be soft!! Love it! I stumbled upon a similar idea that would allow for more air flow. Some genius woman took a old wooden ladder and suspended it on four hooks at each corner of the ladder along with extender chains from the ceiling. She then hung her laundry on hangers from the ladder rungs. The nice thing about it was that it was overhead and thus out of the way, and it also made it so the clothes didn’t touch each other–faster drying. The link below shows what I’m talking about, but it’s not the exact post I was thinking of. That’s cool – something similar for pots in the kitchen would look very farmhouse chic, too. hate basement drying, but dry outside all summer. I was thinking along the lines of what Jessica mentioned. My concern with the one hung vertically near the wall would be the time needed to dry it. I’d envision one suspended from the ceiling by cords through eye bolts. You could load it up at a convenient height and then hoist it up near the ceiling where it would be both out of the way and warmer. And it could be stored up there when not needed, too. I just added one of those to my plans for my back porch after seeing this! Thanks. You could push the bottom out with a dowel while drying things ( like holding open a piano top) to reduce the items from touching, so they dry faster. I love inventive ideas. Yup, that’s exactly what I was envisioning! I have to make it all “official” but I have a temporary solution doing just that – check out the edit add, above. 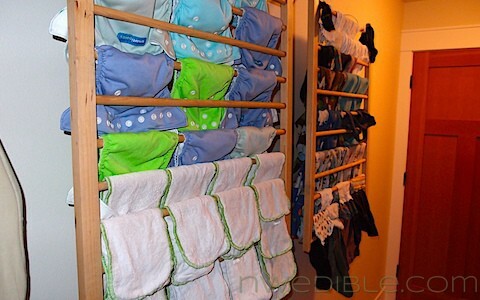 @Jessie: Improved, we hang out diapers to dry. The prefolds that we use as inserts get really stiff, but the rest are just fine. We only have three or four prefolds, everything else is micro-terry, and the diapers themselves are PUL & fleece (Fuzzi Bunz). gosh they look lovely, and the price is right! Here in Australia line drying is quite the norm, and we have a line under the eaves, so out of the rain. When the dryer broke we never replaced it, and i don’t miss it at all. Thanks Africanaussie! I hear that Australia is basically way ahead of the US in a lot of things like this…I’ve had friends describe the different types of outdoor racks you guys have, and your rainwater capturing is super advanced too. Plus I think you invented Permaculture! Australia seems to have it going-on when it comes to greener living stuff. I use old fashioned terry cloth nappies on my baby and I don’t have a big problem with the fabric getting too stiff, though I suppose it does soften pretty quickly once it’s on the bum and a little bit moist. I use these nappies because they are cheap and quick to dry. I made a few prefold types but they take ages to dry in comparison. My dryer is electric, so I can vent it into some old pantyhose right into the house all Winter, then swap it back to regular outdoor venting when the weather gets hot. (Do not vent gas dryers indoors – danger, danger.) I only run it for maybe 8-10 minutes, then pull out everything that has dewrinkled and hang on hangers on the shower rod or on a drying rack to finish drying. Then repeat until the balance is dewrinkled. I usually just finish sheets in the dryer because they are so quick. This adds a little humidity to the house, saves on heating, there are no crunchy towels, and no ironing is needed. If you line dry and have crunchy towels, they can be revived by popping in the dryer for a few minutes with a couple of pretty damp washcloths. I like your creative solution, and it looks so much sturdier than my little wooden rack. So, my gas dryer would kill us, is that what you’re saying? 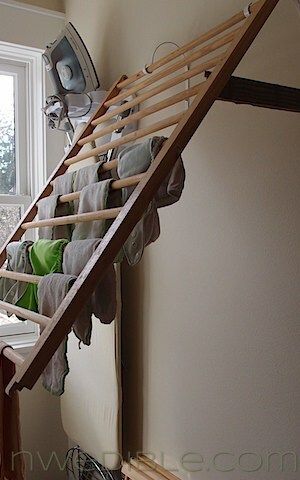 😉 I have a long banister railing indoors where I hang out my sheets. I like that they don’t get as wrinkly when they hang dry. The only thing worse than wash is ironing, so I avoid that at all costs! Good tip about the towels. I think in our family, it would be a big step in the right direction to hang dry all BUT towels, washclothes and kitchen rags. Hmmm…maybe I need to do a dryer-free blog challenge! I line dry for part of the year, starting roughly now and going until October-ish. I’d love to line dry outside, but we’ve got neighborhood rules against that sort of thing. Fortunately, we have a south-facing sunroom where I can string up about 100 feet of rope and can line dry indoors just about everything except towels and jeans (too heavy when wet, and they take all day except for at the height of summer). The trick I’ve learned is to be ok with not getting all the laundry done in one day. Sheets should get their own day. Nothing else fits with all our sheets on the lines! I wish I could line dry inside, our basement is stinky and it’s humid in MD so . . . no go. One of my yard projects this summer is installing a line outside, though I’m sure the birds will make sure to poop on everything (lots of trees in our yard). Brilliant use of a baby jail. Love your terminology. I grew up where we only used the dryer in the winter. My parents had six kids. Sadly I have no yard as an adult, so our spare bath turns into the drying area on laundry day. 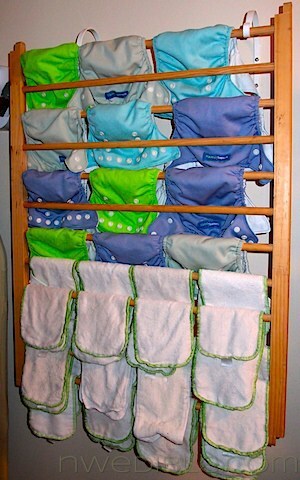 I use a good old fashioned drying rack, the towel rods, the shower curtain rod, the door handle, the door. On laundry day it can be hard to find the commode in that bathroom. CLEVER! We use one of those old-fashioned cribs to raise chicks in. I once bought some clothes at a garage sale that looked NEW and were SO soft. I asked the lady (with a French accent) how she did this. She told me she put all her clothes in the dryer for 15 minutes then hung them up to dry. She said she has been drying her clothes that way her whole life. She thought Americans were weird cooking all their nice things to death in the dryer. Nice. I have kept the crib for a smilar reason, its solid wood so a repurpose is on my mind. We repurposed the ‘baby’ dresser, which had a fold down top for change table, and drawers that my monkeys climbed and broke, into a childs art desk (no drawers, add a bar stool) and a fold down top is now my tv stand with a nice space to slide electronics underneath. I like the garden idea too. 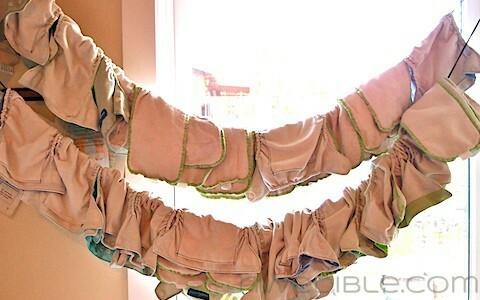 I dry my diapers/inserts on pant hangers, you know the plastic ones stores seem to think you want to take home. In my small landry room we have white wire shelving so the under side is a perfect place to hand a hanger. We also have wall monunted ‘bars’ that fold flat to the wall to hand other things on hangers like shirts, and jackets. Now I’m gonna see if I have room for a crib rail on the wall. We just recently lived in Brazil for over a year. In Brazil a clothes dryer is a luxury as is a back yard. So all clothes drying is done in the house. To save room they have racks on the ceiling that look like your baby gate panels. They use a pulley system on the 4 corners of one panel to raise and lower the rack. You store it in the highest position, lower it to put the clothes on and pull it up allowing airflow all around the clothes. I miss it so much!! There is a ceiling mounted drying rack available from Lee Valley and Veritas under hardware, laundry on http://www.leevalley.com. Does anyone have experience with the wall mounted one from lee valley? It looks ideal but wondering if the little hooks that go on the opposite wall just pull out when wet laundry gets placed on. Thanks for all these great ideas! While we line dry in summer, Northwesterners and really most places you should be careful about the amount of moisture inside the home. Most building science experts will tell you that this has the great potential of causing mold and not always in obvious places because of the convective cuurents drawing moisture up and into wall cavities and attics. Just something to consider. At some point I want a sun room off the back door or in the side attic with good ventilation to have more than 3 months of drying time. I line dry my clothes outdoor but found a little bit difficult when the rainy season comes. my husband hang a quite long steel stick from wall to wall in my laundry room. It is helped when we don’t have much laundry but if we found it over loaded, we are overwhelmed. This idea will save more place. I think I am going to make the same as this. Thanks for sharing this great tips. 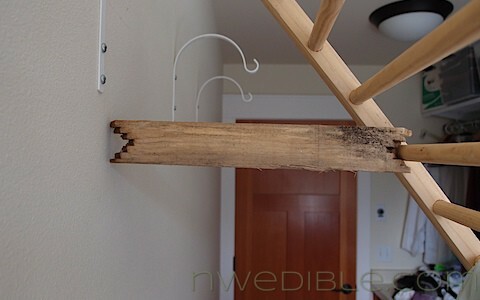 I love the idea of a wall mounted drying rack like this. Where I live it is humid enough that we frequently have trouble with mold on our walls so a rack like this will not work well. I did find a portable clothes drying rack that allows for lots of air flow around clothes for the fastest drying time. Especially if I can place it under the ceiling fan for just a little bit of help. Really neat and creative idea! We have an broken crib that would repurpose well for this. But, I’m trying to figure out where we can do this in our house. I’m new to cloth diapering, actually haven’t started yet, baby is due in a few weeks. 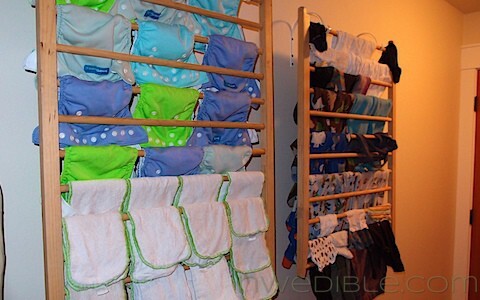 How long does it take for your diapers to dry indoors? I’m guessing if there is not a window near by for sunlight they will take longer. And suggestions you can give would be great! Thanks! This would be great for our handwashing challenge! This is so awesome! That is so creative! Now it makes me want to do this too! We do the same!! Where we live we can’t hang anything outside; so we have our two sides of “baby jail” hanging from the ceiling in the livingroom where our biggest windows are. i am thinking of giving up my dryer. our old one almost caught the house on fire today. i saw a crib clothing thats hangs from the ceiling. for the adult clothing you can hang on hangers.. i am trying to see what hardware would i use for hanging a crib side to my ceiling and it being secure.. any ideas? I’m very excited to find this tutorial! My brother is giving us his son’s outgrown very new crib and I’ve been trying to think of something to do with our old, outdated, drop-side crib. I was googling today to find a DIY drying rack because I did not want to spend a fortune on a brand new one! Perfect combination! Thanks so much! the plant holders are a great idea! I have an unused baby gate (for when my dog was a puppy) and was trying to re-purpose it as a drying rack. I was considering hinges and all this other complicated hardware, but the plant holders are such a simple and easy idea. Thanks!